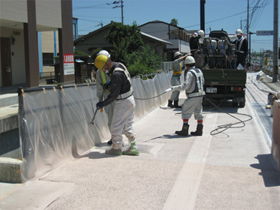 The THERMOTEC E construction method is coating (spraying) type heat-blocking paving that uses a low-odor, two-stage hardening type reactive emulsion. 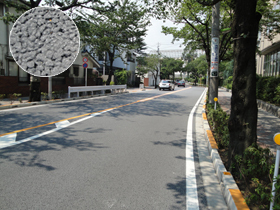 THERMOTEC EP is used on porous asphalt paving, while THERMOTEC EM is used on dense graded asphalt paving. In both of these materials, the unpleasant odor that was present in previous resin type materials is inhibited, making this a material that is gentle to the environment. 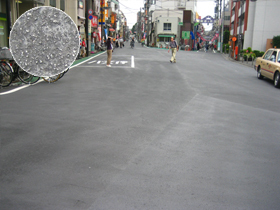 Reduces the midday road paving surface temperature by a maximum of 10℃, which contributes to improving the heat environment in city areas. Because unpleasant odors are limited, this method can be safely implemented in city areas. Even after implementation, the functions of the existing paving will not be impaired. In addition to increasing the skid resistance of porous asphalt paving, this method also inhibits the scattering of aggregate.